On April 10, 2010 at 6 p.m., Mag:net Café will launch “Ambush: Parents Trapped” by Andrew Villar at Mag:net Café Katipunan. The event will feature an exhibit of original artworks and reprints of “Ambush”. Singers and musicians Cookie Chua and Lito Crisostomo, among others, will grace the event. Artists from Samahang Kartunista ng Pilipinas (SKP) and Manila Bulletin will also be present at the event in full of support of “Ambush”. But the real highlight of the night would be the “Meet-and-Greet Ambush”, where fans and friends will be able to shake hands and meet their favorite comics heroine—in the flesh. 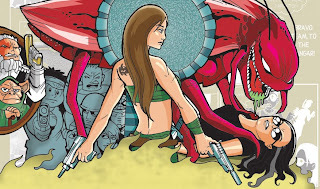 The teen super hero, who epitomizes the new-generation Filipina, defending the good and crushing the villains of todaywill don her battle suit, not to fight evil for one night, but to mingle with Pinoy comics fans and supporters. The comic launch is brought to you by Mag:net Cafe and glyphwall.com.